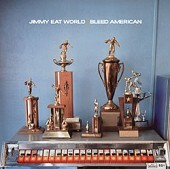 The latest from Jimmy Eat World, Bleed American, is a spastic, blinding rock album. From the sweeping emo hooks to the chaotic, bruising rock charge, Jimmy Eat World delivers one crushing song after another. The title track is a swift, painless shot of equal parts power-pop, punk, and emotions. "The Middle," is a chunky, climbing pop song that builds from pure sugar to jagged rock, leaving you breathless between the chorus and verses. However, the band is not a one trick pony by any stretch of the imagination. Hear You Me slips down into a silky, soft pop song, slow and steady, but as emotionally charged and lyrically deep as the songs that knock you out with noise. Instead of hiding behind the rock, Hear You Me showcases the band's ability to craft beautifully structured pop songs, sunshine melodies, and warm hooks that make you feel important to be here, to be alive.